The final three groups at the Lorena Ochoa Invitational in Mexico were allowed to delay their third rounds by nearly an hour because of traffic. A bus carrying four players to the course took two hours to complete a trip that normally takes 15-20 minutes. Being more than five minutes late usually results in disqualification but officials decided to waive the rule because of "exceptional circumstances". 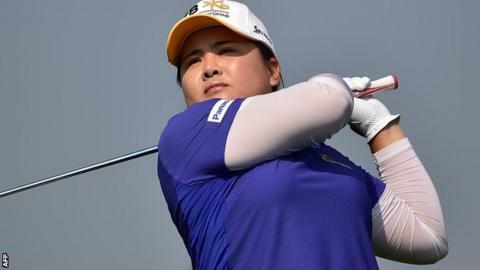 World number one Inbee Park carded six birdies for a three-stroke lead. Park was on an earlier bus that, though delayed, arrived well before her tee time. The 27-year-old shot a five-under 67 to move to 10 under, with fellow South Korean Sei Young Kim in second. Halfway leader Minjee Lee slipped seven shots off the pace after a three-over 75. American Angela Stanford, who finished the day nine shots off the lead after a four-over 76, was one of the players on the delayed bus. She tweeted: "Learning that GPS is a wonderful thing. Hour in a bus and still no sign of the golf course. "Two hours and 15 min later we arrive. Thank you LPGA for letting us play!"